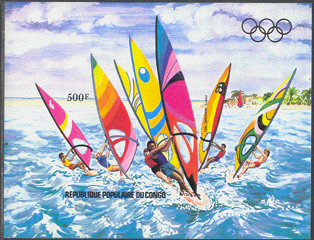 44146 ND CONGO (1983) Windsurfers*. Imperforate S/S. Scott No C309, Yvert Nos BF33. 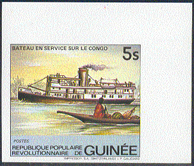 44147 ND CONGO (1984) River boats*. Set of 4 imperforates. 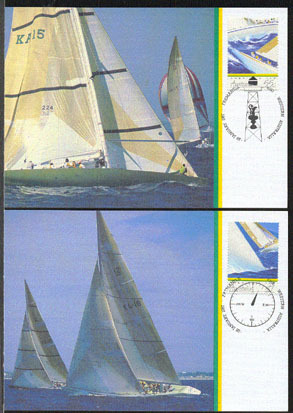 Scott Nos 704//10, Yvert Nos 730-3. 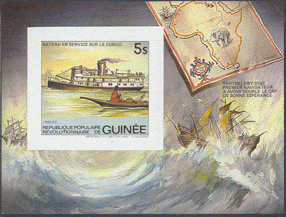 58476 ND IVORY COAST (1984) Ships*. Set of 4 imperforates. Scott Nos 723//9, Yvert Nos 691-4. 44156 ND GUINEA (1984) Steamer*. Imperforate. 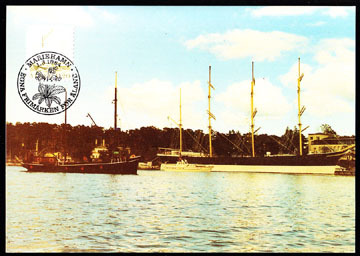 Scott No 883, Yvert Nos 736. 44157 ND GUINEA (1984) Steamer*. Imperforate minisheet. Scott No 883, Yvert Nos 736. 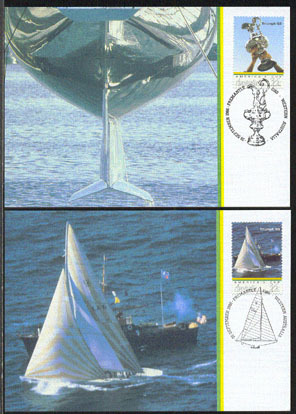 73333 MAX ALAND (1984) Gaff-rigged sloop*. Maximum card with thematic cancel. Scott No 2. 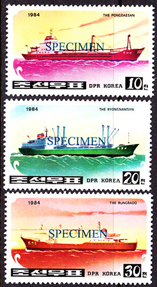 67746 SPE NORTH KOREA (1984) Container ships. Set of 3 specimens. Scott Nos 2413-5, KSC Nos 2452-4. 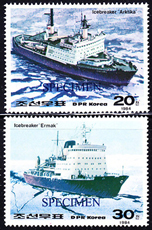 67750 SPE NORTH KOREA (1984) Icebreakers. Set of 2 specimens. Scott Nos 2433-4, KSC Nos 2472-3. 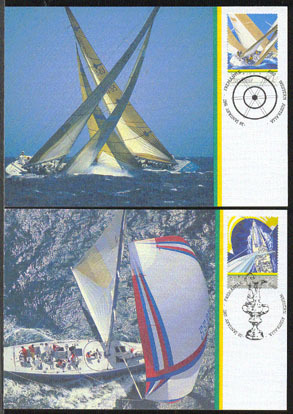 31101 EP ST. VINCENT GRENADINES (1985) Windsurfers*. Imperforate plate proof pair from margin of sheet. Scott No 484, Yvert No 408. Not easy to find! 58214 FDC F.S.A.T. 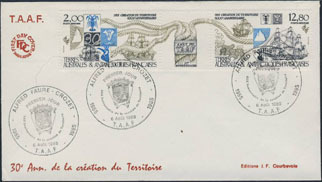 (1985) Sailing ships*. Ropes*. FDC with cachet. Scott No C90a, Yvert No PA91A. 58160 FDC F.S.A.T. 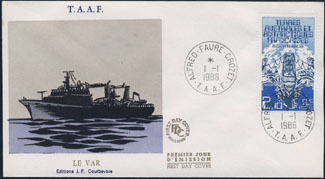 (1986) Ship "Le Var"*. FDC with cachet. Scott No 123, Yvert No 120. 58161 FDC F.S.A.T. 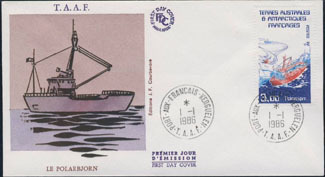 (1986) Ship "Le Polarbjorn"*. FDC with cachet. Scott No 124, Yvert No 121. 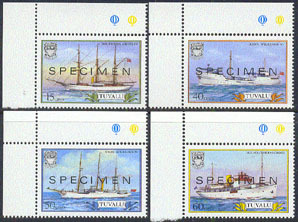 46512 SPE TUVALU (1986) Sailing ships*. Set of 4 overprinted SPECIMEN. 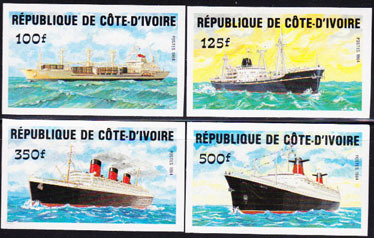 Scott Nos 353-6, Yvert Nos 416-9. 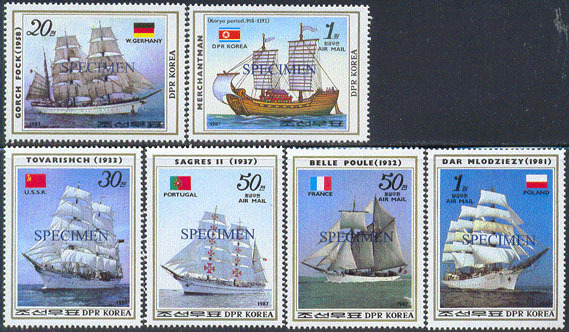 67795 SPE NORTH KOREA (1986) Tall ships. Set of 6 specimens. Scott Nos 2628-33, KSC Nos 2681-5. 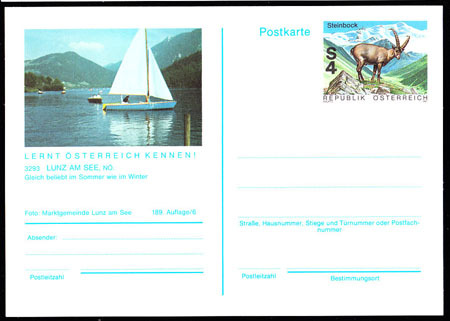 72846 ENT AUSTRIA (1987) Sailboat on Lunz am See. 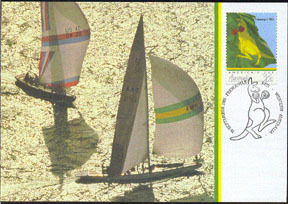 Postal card (O) with corner illustration. 46905 EP AUSTRIA (1987) Ship on Achensee Centennial*. Black proof. Scott No 1402, Yvert No 1719. 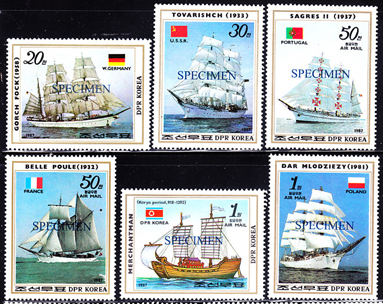 49063 SPE NORTH KOREA (1987) Sailing ships*. Set of 6 overprinted SPECIMEN. KSC Nos 2681-6. Scott Nos 2628-33.